Is it a Zombie Virus? I spent last night watching a number shows from the series called the Walking Dead. I’m not really sure why, but there I was, scrolling through the On Demand menu on my cable service and they had the whole first year’s sequence available. I had already checked the regular channels and there was the usual fare available; Crap, mixed with mind numbing drivel, and boringly old reruns, all accentuated with an enormous number of commercials for other types of Crap. I spent about a micro-second deciding. Watch Crap with commercials or ……..
watch a series that I had no clue if it was good or bad, but they that had no commercials. So, I made the least painful decision, I watched the Walking Dead. Now, I am not normally a Horror Movie fan. They were cool a few decades ago, but generally speaking, once you have seen one Zombie shuffle across a field with blood dripping from his distorted and foul mouth, you pretty much have the whole movie plot figured out. And, watching more than one, or maybe two, of any of these specialized genre’s of Horror Shows becomes a true waste of your time and a serious test of your intellect. Zombie Traits and Habits and do they come from a Virus? I decided I would watch and analyze this series from a very special perspective. I would watch the series as if I was from another planet, and I was here on this Great planet Earth to spy and learn how all of the different species interacted. My goal would be to decide which of these different species was the superior species, and then which would be the one that my people would partner with to take over the planet eventually. Or some such ulterior, devious and power motivated plan. I bought this book before I wrote my article and it was full of entertaining points about Zombies. So, after I had watched the first four shows of the series, here is my preliminary report listing the strengths and weakness’ of the species known as the Walking Dead, whom I shall forthwith just call Zombies. But they are a deviant form that occurs when they catch “the Zombie Virus”. It seems that the Virus itself, is transferred to a Human when a Zombie Bites other Humans, thus causing excruciating pain and subsequently death. And, after a still undetermined period of time, the once normal humans, morph into a Zombie themselves. 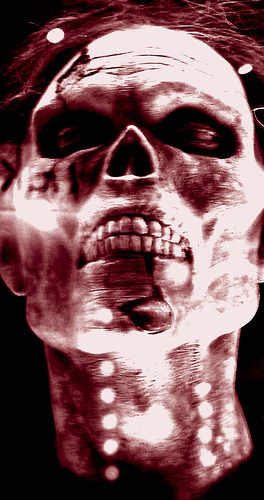 A Zombie exists exclusively on a diet of raw Human flesh. ZOMBIES do not consume any other type of food, not other meats, vegetables, fruits, nothing but Human flesh. Zombies do not drink other fluids of any kind. other than the incidental blood that they take in while devouring their normal human counterpart. Zombies never Urinate or Poop. Hey, I just watched a number of the shows, covering a timeline of months and there was never an instance of a Zombie saying “excuse me, I have to go to the bathroom” or “Hold on a minutes guys, I gotta Pee”. I have not even observed any Zombie Poop lying around on the streets. And let’s admit it, these Zombies are not what you would call the neatest species we have observed, they eat and don’t even wipe their mouths, they have horrible dental care habits, and they always look disheveled, to say the least. So, a little Poop, lying around should be expected. Right? Zombies do not exist for long. From what I have seen the Zombies, once they become Zombies, have a very short lifespan. I make this assumption by applying our knowledge of the normal Humans that we have already studied. Normal humans must consume food and fluids regularly, and they will die of they do not get at least minimal amounts of both, within weeks and usually days. So, if Zombies are morphed Humans and they do not urinate or Poop, then they must die pretty much the same as the normal humans would, or most probably, explode, if they eat like I have seen so far. Zombies have absolutely no sense of style. Their attire is, and I am trying to be kind here, disheveled, wrinkled, torn, and always stained with other people’s blood. And, if you look closely, what they do wear, does not fit them well. So, we must assume that they just don’t care for fashion at all. They do not talk or communicate in any way. They will follow another Zombie that they see another of their kind walk by, generally, with the hope that, the other Zombie is going to eat someone, and might share the humans body with them. Otherwise the only sounds they make are the occasional growling noises, and even these are rare. They tend to just lie around until a very stupid, normal human, walks by them. At which point, they will growl and rouse from their stupor and start their chase. Here, I must explain that Zombies are very slow and uncoordinated, so a Zombie chase is more of a lumbering walk in the general direction of whatever human roused them from their rest. They are uncoordinated and they have a horrible sense of balance. They walk at a slow, stiff-legged pace, and often must even hold their arms out to maintain their balance. I assume that they are un-insurable because it is obvious that their dental and physical health is atrocious. I mentioned their poor dental hygiene, but they often have limbs missing, eyes dangling from their eye sockets, no lips on their mouths, horrible teeth, and often substantial holes and cuts in their bodies. Some even walk around with broken bones jutting from their flesh. Zombies have a Code of Honor. Zombies do have a pack-like code of honor in that they will not eat each other,regardless of their overpowering hunger.. They would rather die of starvation than attack or even say anything insulting to a fellow Zombie, much less eat another Zombie when hungry. Zombies have very strong jaw muscles. I am not sure if this is a result of the strange virus that turns them into Zombies, but Zombies are able to rip enormous pieces of flesh from a normal human’s body in one bite. They never seem to chew their food, and just continue to swallow large chunks of flesh before going in for another bite. A very unhealthy habit. Zombies have no dining etiquette at all. Once a Zombie has disabled a normal human, they then dine on the body, not with any form of eating utensils. They just continue to tear these large chunks of human flesh from the disabled, and often screaming, body until they have eaten their fill. At first glance, after what I have observed so far, we should definitely partner with the original form of the species, or the Normal Humans. They have a lot of faults, such as their peculiar inability to get away from such slow and stupid creatures as the Zombies, but otherwise they seem to be our best choice. Well, I recommend that we keep a colony of these strange creatures, isolated of course, somewhere on their planet and use them as a sort of clean-up crew if the normal Humans become a problem in the future. By that I mean that we can take any of the uncooperative Normal Humans and drop them into our colony of Zombies, and they will happily take care of our dissident Normal Human disposal needs. Anyway, I hope you enjoy this little mental digression of mine, and I plan to go back on the next rainy night available and finish the series. So, I plan another report on how Humans can be so stupid as to get caught and eaten by such an inept and uncoordinated thing, such as the Zombie species, that I have described above. The Walking Dead, Season 1, Episode ! DarbyCallahan- Thanks for the read and the comment. I am really glad that you enjoyed my often strange sense of humor. *still laughing...your observations on zombie fashion sense, or the lack thereof, just slayed me...thanks for the laughs! Thanks, siningirisheyes, for the great comments on my Hub. As I mentioned, I watched the first season on Netflix on a bad weather day and although impressed with its difference from other such movies I had seen, I went into thinking about what an alien species would think if this show was all they had to go on. Anyway, thanks again for the comment, and I did enjoy writing the Hub. Jami, Thanks and I'm glad that you liked my little digression. Have a great day! thought sandwiches, so true! if we can learn enough to control this peculiar sub-species, who knows what we might be able to do next? possibly even control a species thatis totally tof control? CONGRESS? Oh to Dream! There are very few things I take seriously in life...potential zombie outbreak attacks are one of them. As such, I am typically looking for new views or synopsis of the subject. The household tumbled to the Walking Dead series last week. We watched. We enjoyed. We learned. Your academic study here has added a layered texture to what was only surmised. Feenix, being from the South myself, I happen to know that there are things that people with "the Power" can do, things that you do not want to be involved in. As we used to say in the hills, :You don't mess with no Voodoo!". Thanks for the comment Feenix. I am not a "horror movie fan" either, but because of this well-written and very descriptive post, I am curious about the "Walking Dead." In fact, I just might watch an episode or two, or more, tonight. Interestingly, I sort of believe that zombies really do exist and that is because my roots are in New Orleans -- and because of that, I have quite a few relatives and associates who believe in voodoo. Thanks Ringandping for the comment and the suggestion. Awesome post! If you like that show there is a movie called Zombie Land that is pretty funny too. The movie starts off with a description of how to stay alive when zombies are around and is is hilarious. I think it is still on Netflix with no commercials. check it out net time you have nothing better to do. QC, you are a man of standards! and as such, I appreciate your kind words. thanks for commenting. Great hub. Sorry if I offend anyone who likes this "genre" but I find anything horror related to be the most useless crap created by man. Now paying my cable bill THAT is real horror. thanks Ardie! I'm so glad that you enjoyed my little Halloween story. Thanks! Again, I apologize about my earlier comment. I really like the show. Now that I understand the humor, I am going to follow you too. Looks like you have a ton of interesting hubs! I look forward to reading them. Aloha. Brittanytodd, Not a problem, at all. We writers end up writing about pretty much anything at times, and this was one of my "Dons twisted Mind" creations. Anyway, thanks for the comment,a dn I am now a follower of you and I look forward to trying some of your Cupcake recipes. Have a great day! Oh, no offense taken. I guess I didn't get that it was a satirical narrative and thought you were making funny comments about this particular shows' zombies. I hope I didn't offend you by clarifying a few things about the series. Sorry I didn't get the gist of your hub. I love this show and I enjoyed this hub, but I suggest that you watch more. Some of the zombie traits you described are found in other films and tv shows, but the Walking Dead has a different take on what zombies are and how they work. For example, in the last episode of the first season, you will see that the zombies eat other meats (i.e. a horse) as well as other things like tree bark (see season 2). I also think that the Walking Dead zombies are not infected by a virus. The tv show is based on a comic book in which the "virus" is airborne. It infects people after they die even if they weren't bit or scratched. I suggest you learn more, watch more and update your post as you do. Thanks, I hope everyone enjoys my weird sense of humor for this very strange Holiday. Have a great Halloween. I enjoyed this hub. I recently started watching The Walking Dead as well which has been just in time for Halloween. I laughed when I read your comments I never thought of zombies like that. Its true they do have a bad sense of style and they are very lazy with a major need of medical attention. Great Halloween hub :) lol @ uninsurable.